When there are big gaps in between my posting you can guess that I'm not feeling well. I have had a very hard time now for about 2-3 weeks. I really think it is the infection from the cellulitis dragging me down. I am beginning to get very discouraged. All I feel like doing is sleeping. Anything I do manage to get done is such a struggle...even including scrapbooking this time. Usually I am able to at least scrapbook. It helps to keep my spirits up. I sometimes wished Kristi lived closer and I think she could help me a little bit. I feel so abandoned so much of the time. I don't blame anyone because they are busy with their lives. But, maybe she could pick me up and take me to the pool occasionally. The pool is the only thing that give me a little big of a lift. It takes down the swelling and give me a real boost physically. I have included 2 layouts with this post. The one entitled "You Are So Beautiful" is one I did for the design team this week. We were supposed to do a layout using circles. 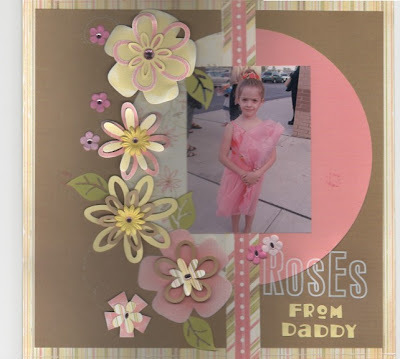 The 2nd one (Roses from Daddy) I put on here is one I might have posted before but I entered it into an online scrapbook magazine yesterday and they are going to make me the featured layout on their page June 12th!! That was kind of exciting...an affirmation of my scrapbooking ability. Mothers Day was special in that my family made me feel special...but...I didn't get to go to the dinner and was SO disappointed. I was just feeling too sick. Another thing is that I woke up with muscle spasms in my low back so had to take a muscle relaxer and that kind of knocked me out. Definition of CellulitisCellulitis is a diffuse, spreading skin infection. Description of CellulitisCellulitis is a skin infection that sometimes accompanies damage to the skin, poor circulation, or diabetes. Streptococcal or staphylococcal bacteria enter the skin through a cut, puncture, ulcer, or sore, producing enzymes that break down the skin cells. Erysipelas is a superficial form of cellulitis. Causes and Risk Factors of CellulitisThe lower extremities are the most common site of infection. A skin abnormality (e.g., skin trauma, ulceration, tinea pedis, or dermatitis) often precedes the infection. Scars from saphenous vein removal for cardiac or vascular surgery are common sites for recurrent cellulitis, especially if tinea pedis is present. Frequently, however, no predisposing condition or site of entry is evident. Symptoms of CellulitisIn cellulitis, the skin becomes red and swollen and is both warm and painful to the touch and is sometimes accompanied by fever, malaise, chills, and headache. I have tried to push myself this week but I just have NO energy at all. Then my mind plays games with itself...I begin to think I'm just lazy because I don't get anything done but reading this article makes me feel a little bit better. I keep hoping that tomorrow will be better. I did manage to go with Rhebeca to her open house at her school. What a privilege that was. I could tell that all her teachers really like her. I'm not surprised because she's very likeable!! Now that's something this Grandma doesn't like to hear but even so it will happen! I took a good picture of Tyler and Rhebeca in front of Webster school. I will have to post it later because right now my camera is in the car. 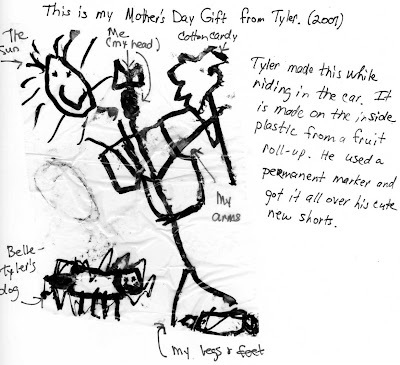 This is my Mother's Day gift from Tyler. He colored it on the wrapper from the inside of a fruit roll-up. He didn't have anything under it and used a sharpie pen and was wearing his cute new shorts and got pen marks on his new shorts. It meant a lot that he would do this for me. I haven't felt well at all lthe last few days. I have the cellulitus back in my leg again and it makes me feel fluish and I have only felt like sleeping for the past 4-5 days. I have started on the antibiotic and just today am feeling a little better. Both the therapist and the doctor said NO shaving my legs till I'm sure the infection is gone. I'm sure it bothers me more than it does anybody else. I"m too tired to write much more but wanted to get this picture on here tonight! 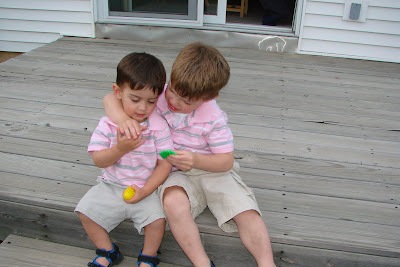 I thought that Kael and Kaleb looked so cute in thei matching shirts that I just HAD to get a few pictures of them. Do you know how hard it is to get a 1 year old and a 3 year old to both smile at the same time and put their arms around each other? ha ha!!! Anyway, the pics are still pretty cute! 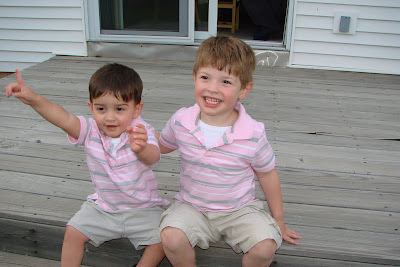 I had a big container of pretend food and that is what they are holding in their hands in the 2nd picture. I haven't been able to figure out why I've been so fatigued the last 4-5 days. All I want to do is sleep and I just can't seem to fight it! Then today when I was looking at my leg I noticed the cellulitus is coming back. That is so disappointing since we've been so faithful to wrap my legs every morning and evening. I just don't understand it sometimes. Went swimming with 3 of the grandkids today. It is so much fun to see them having sheer joy...and hearing their laughter. A ll three of them had a great tme and hearing their laughter brings me such joy! On the way home I loved hearing Tyler and Rhebeca talking to each other while having such a good time. Caden was in the seat in front of him and I could hear him practicing some of his words...some he wasn't supposed to day...Oh poopoo. He thinks it's pretty funny. This is the first layout I have done for Isabella. This month for the Memory Zone we were supposed to do a layout with 5 or more pictures. It was a real challenge but I came up with this one and FIVE pictures!! I have fallen asleep 4 times (make that 6 now ....ha ha!) trying to type this morning so will come back later when I can stay awake and type some things!